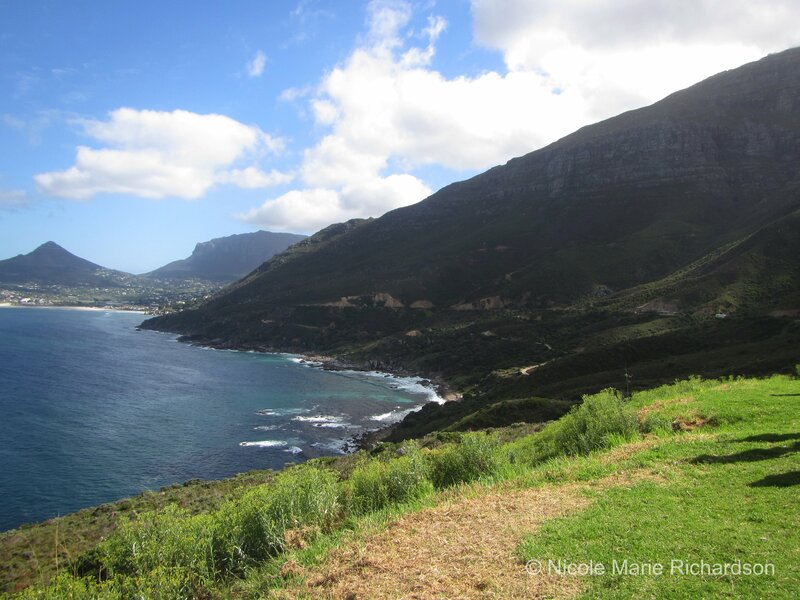 On our second day in Cape Town we boarded a bus at 8 a.m. (1 a.m. EST) with our Smartours guide heading to the Cape of Good Hope Nature Reserve. What followed was the second most scenic drive I’ve ever seen (the first was in Sardinia). 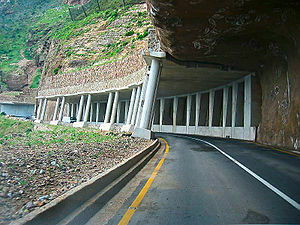 Today they’ve made many safety upgrades on the road, including netting to stop the rocks, that they pay for with a toll. For those of us who dared to keep our eyes open on this drive, the reward was sweeping white beaches a thousand feet below us and steep, massive mountainscapes all around in different earth tone hues. 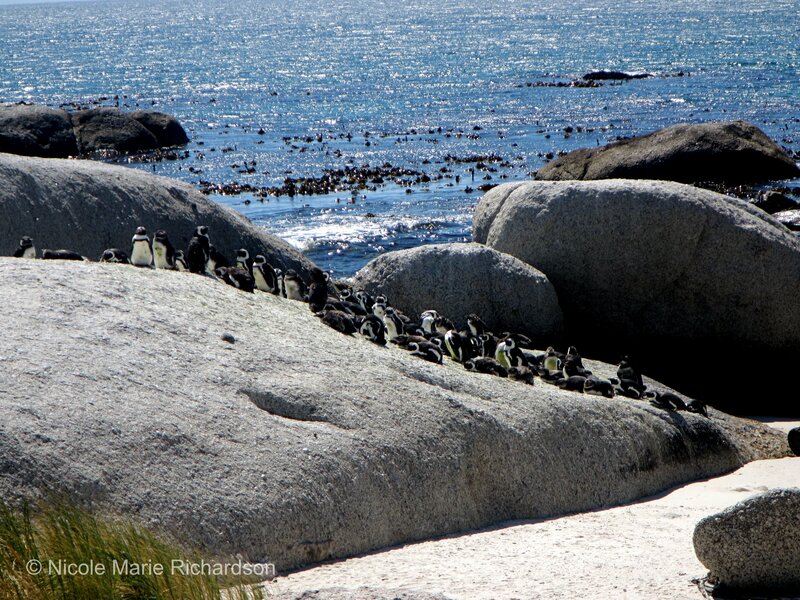 After driving through Simon’s Town, our first stop was Boulders, named for its big granite rock formations, where a colony of African penguins hang out. The penguins are tiny, standing a little over a foot high. Apparently we missed the day’s action because by the time we arrived (at 9 a.m.) they were mostly in chill mode relaxing in the sun. Sadly, our tour guide said the penguins are dying out because of a skin disease that affects the babies. But on this day there were about 250 penguins just inches away from us. The boardwalk is closed off however and keeps overzealous tourists from actually going onto the beach and chasing the birds. That didn’t stop some from reaching through the wooden planks and touching them, despite warnings that they bite. My tour book says it’s also possible to rent a wet suit and swim along side the penguins but I didn’t see any of this happening, not that I’d want to get naked with the smelly (albeit cute) animals. 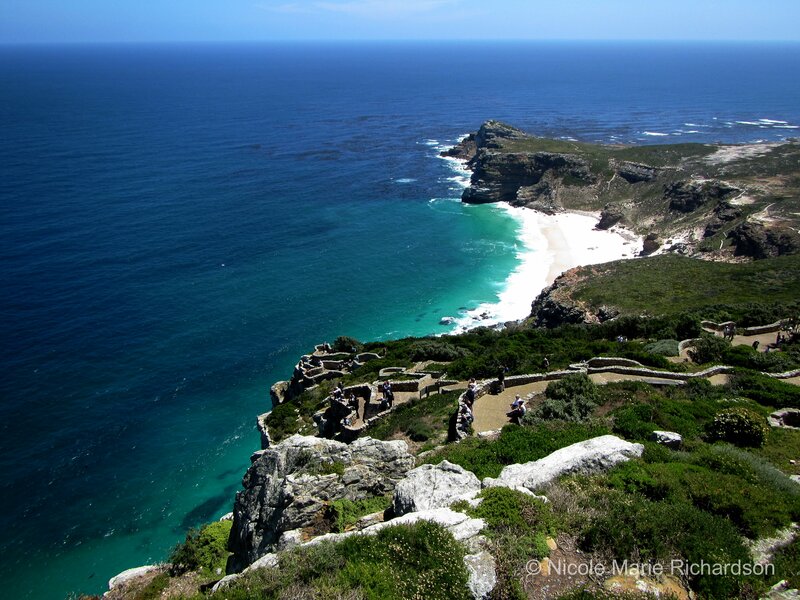 Our next stop was the Cape of Good Hope, a rocky beach that marks the most southwesterly point of the Cape Peninsula. The highlight here is the sign that people line up to take a picture behind because it marks the point. 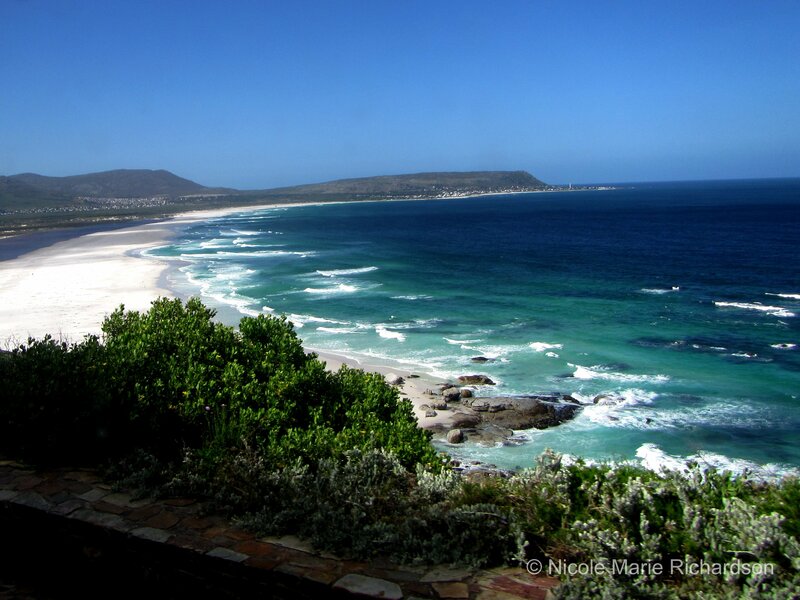 It’s also the place to touch the water where two oceans meet, the Atlantic and the Indian oceans. We saw wild ostriches here as well as a few Bonteboks and a dead baby seal. Baboons like to hang out in this area but we didn’t get to see any close up. 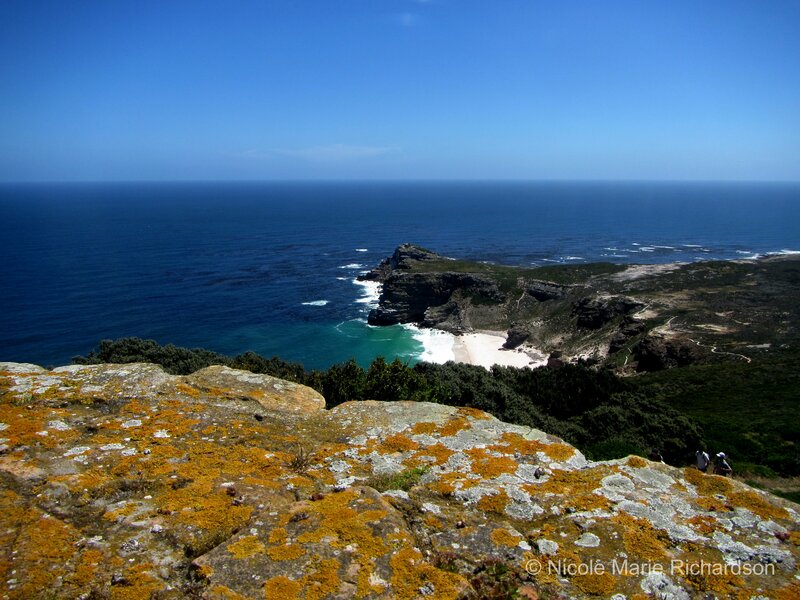 Now it’s possible to climb the mountain that rises up from the water’s edge from here using steep stairs and go to the top of Cape Point, but we road up on the bus. The bus dropped us at a landing where there is a restaurant, gift shops, a restroom, and The Flying Dutchman funicular rail that will take you the rest of the way to the top if you choose not to walk the distance. 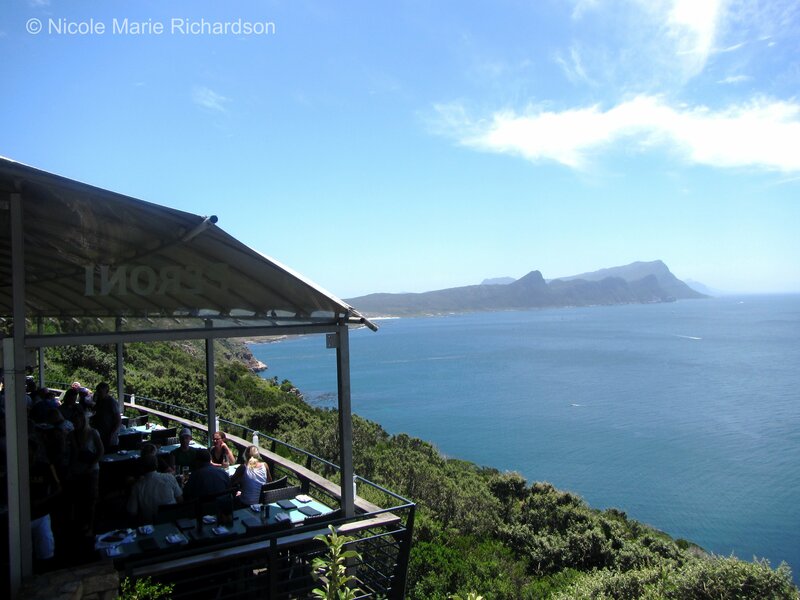 Before heading up, we ate at the very swank Two Oceans restaurant. The food is amazing and the view is spectacular. Serving mostly seafood, I had the prawn linguine and I wasn’t disappointed. They also have a full sushi bar, surprisingly, but I would only give it a seven out of 10. My rice was a bit hard and my sushi was a little too big to fit in my mouth in one bite. The other girls had no complaints though. 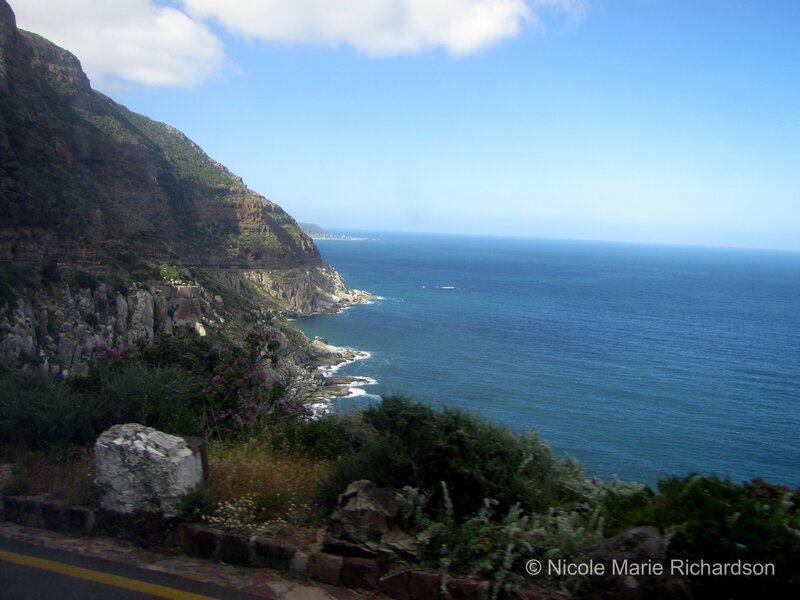 We took the funicular up to the top of Cape Point where the views are, once again, stunning. We decided to walk down, for the exercise, and my legs were on fire for the next three days. I can’t say it was worth it. 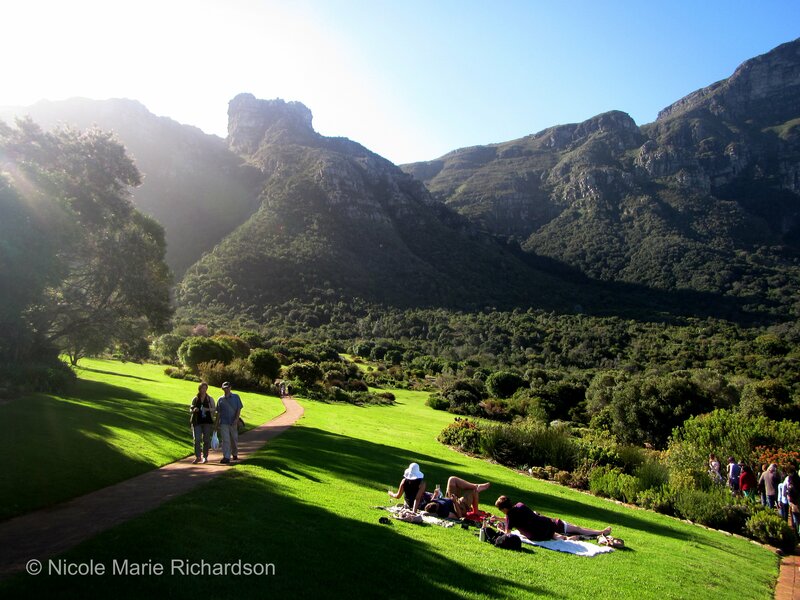 Our last stop on this $80 per person, full day tour, was the Kirstenbosch Botanical Gardens. Honestly, we were so tired when we arrived here I considered staying on the bus to sleep and skipping this attraction. Boy I’m glad I rallied! This is not your ordinary botanical garden. It’s more like a guided tour through a scene from Lord of the Rings. The mountains are covered in a blanket of green, the sunset cast a beautiful orange haze over everything, and the fields of flowers looked too lush to be real. Families idled on the grass with picnic baskets. It was one of the most peaceful and beautiful places I’ve ever been. To wrap this long post up, this full day tour was one of my favorite points of my trip. Looking back on it, I’m kind of amazed that I stood at the tip of Africa and touched the water where two oceans meet. It was a once in a lifetime experience that I’ll never forget. ← V&A Waterfront: The Food Mecca of Cape Town? Hi Janine! I’m trying to keep up with you!